On a rainy and grey morning of November 1, I made my way through the Brookline neighborhood of Boston to experience a student matinee of Actors’ Shakespeare Project’s production of Macbeth supported by Shakespeare in American Communities. I approached the stone church of the United Parish of Brookline and entered into its gothic-inspired architecture. The altar area was transposed into the set for the play. The company performs in found spaces, schools, theaters and neighborhoods. This setting truly suited their production of the Scottish play. Prior to my visit, they had presented a free community performance at the Arnold Arboretum at Harvard University amongst Fujiko Nakaya’s climate responsive fog sculpture. Students from three schools began to arrive and find their seats among the pews. They came from Boston Day and Evening Academy in Roxbury, Charlestown High School in Charlestown, and over 100 from Medford High School in Medford. For some students, this may be their first time seeing a Shakespeare play live and maybe even the first time in a church. Some of the students from Boston Day and Evening Academy had a connection with one of the actors, Trinidad Ramkissoon, who graduated from the school. 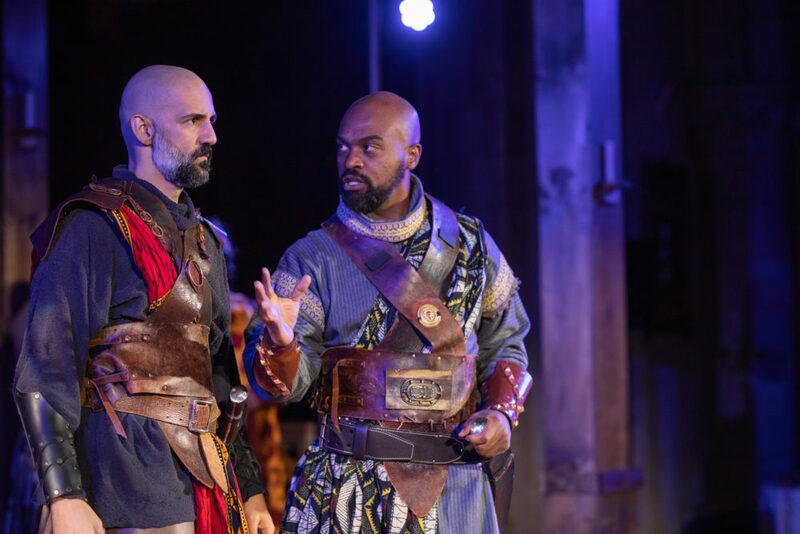 Nael Nacer as Macbeth and Maurice Parent a Banquo. Courtesy of Actors’ Shakespeare Project. The atmosphere was set and the play began. This production is a world premiere of the modern verse translation by Migdalia Cruz and directed by Dawn M. Simmons. The cast included these actors, two of which are from their resident acting company: Steven Barkhimer (Duncan, Portar, Ensemble); Alex Casillas (Ross, Ensemble); Paige Clark (Lady Macbeth); Jade Guerra (Lady Macduff, Ensemble); Ed Hoopman (Macduff, Ensemble); Nael Nacer (Macbeth, Macduff’s Son); Maurice Parent (Banquo, Ensemble); Trinidad Ramkissoon (Lennox, Ensemble); Kai Tshikosi (Malcolm, Ensemble); and Shanelle Villegas (Fleance, Ensemble). The diversity represented on stage was reflective of the student audience. The Costume Designer Rachel Padula-Shufelt had each actor wear a sash of fabric that was representative of their own identity. The company consciously decided to make each performance intimate and filled only half of the pews. Actors exited and entered from various points, especially the center aisle between the pews. These students were immediately drawn into the story and were attentive the entire two-and-a-half hour production and experienced the entire play of Macbeth. As actors entered from the center aisle, students’ heads would turn. When Macbeth looked down the aisle and began the speech “Is this a dagger which I see before me,” some students’ heads turned looking down the aisle and before long the majority of them were looking for the dagger. Following the production, the students had the opportunity to ask questions of the actors during the talkback. These schools received SWAT (Shakespeare Words and Tactics) visits led by a team of teaching artists and actors from the production. All project components explore the language, characters, conflicts and themes of the play through performance activities. Teachers and students approach the play as actors do, bringing the play to life on its feet and out loud in relationships with others. Education Director Mara Sidmore oversees all activities.